deforestation – One Billion Hungry: Can We Feed the World? On the 6th December the Sustainable Food Trust held a conference entitled True Cost Accounting in Food and Farming at the Royal Geographical Society following a two day workshop on the same topic. Central to the conference was the understanding that if food systems are to become truly sustainable, the actual (environmental and social) cost of producing food must be reflected in retail prices. Food producers, suppliers and retailers need to be financially accountable for the impacts of production on environmental and public health. The event began with a story, starting 60 years ago when the need for cheap food drove agricultural development, disconnecting people from the origin of our food and creating an industry where small family farms could not compete. Despite the good intentions to end world hunger and make food accessible to all, the environmental and public health costs were considered too late (if at all). 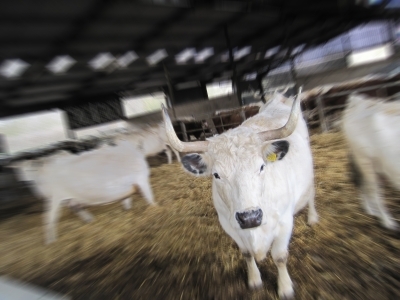 A small group of people (environmentalists and animal welfare lobbyists among them) advocated the need to consider the wider impacts of our food systems, a plea that is ongoing but largely ignored even today. As Patrick Holden, Chief Executive of the Sustainable Food Trust and storyteller, explained, the conference, the largest international gathering on the subject of true cost accounting, aimed to be the beginning of a process of moving true cost accounting beyond rhetoric, objection and protest to one of real action. Kicking off the event was a video message from HRH Prince Charles who began by stating that the biggest challenge the world faces today is producing enough food without doing irreparable damage to the environment and human health, a challenge made much harder by the likely impacts of climate change. He emphasised the need for the polluter to pay despite the financial odds being stacked against this objective. A burning question is whether the polluter pays principle will affect businesses and their ability to turn a profit or instead drive innovation, as in the case of the Land Fill Tax, which created new jobs and instigated greater recycling efforts. We need to understand better how food producers can make a profit whilst also moving to a more agroecological approach. He ended by expressing his hope that the outcome of the conference and workshops would be the commission of a study to find out if it is more profitable to farm by putting nature at the centre of food producing operations. The heart of the problem we face is the “economic invisibility of nature” and in realising that the ultimate source of economic capital is natural capital and not the other way around. We will only inflict conflict and misery if we continue farming based on increasingly weakened ecosystems. Professor Jules Pretty, University of Essex, explained how our understanding of the negative externalities that the modern agricultural and green revolutions have caused began with Rachel Carson’s Silent Spring in 1962, which documented bird losses occurring due to seed treatments. In 1992 Prof. Pretty and Gordon Conway wrote Unwelcome Harvest, which documented the wider impacts of food production but was still only part of the picture. In 1998, a team at the University of Essex published a paper that showed the total cost of agriculture in the UK to the environment to be £2.4 billion per year, in part from the contamination of water by pesticides, soil erosion, organic carbon losses and greenhouse gas emissions. This figure showed that the environmental costs alone of our agricultural systems were higher than net farm income. While similar studies were published in other countries, the outputs were criticised for ignoring the positive externalities of agriculture i.e. its contribution to the environment and human health. In 2005, Prof. Pretty and another of the day’s speakers, Prof. Tim Lang, City University London, recalculated the externalities of agriculture, expanding the boundaries from farm to fork, resulting in a lower figure. The most surprising result was that the environmental burden arising from food miles was greater than the environmental cost on farm, and most significant of all was the minimal impact of importing food and transporting it around the country compared to household shopping trips. Prof. Pretty then went on to discuss our current farming systems, divided into three and represented by a glass of water. The first, almost filled to the brim with water, represented an industrial system, very productive but with lots of spillover effects. 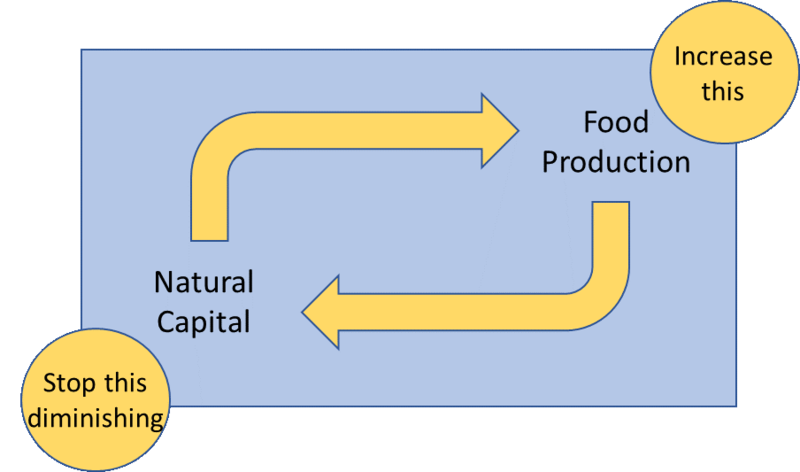 The second, half full, showed moderately productive systems trading some of the productivity of intensive systems for a lower impact on the environment. The third glass, with only a small amount of water, represented the 2.4 billion producers in the world who have yields of ½ to 1 tonne per hectare (compared to the UK average yields of 8t/ha). The latter could, theoretically, more than double yields with little environmental impact with the right agroecological techniques and farmer engagement. While some argue that feeding the world is more a matter of better distribution and reducing food waste, Prof. Pretty believes we need to focus on increasing the food production of these 2.4 billion farmers, many of whom are poor, on their own farms. But we need to increase production in the right way. Of course the environmental impacts are only one of agriculture’s hidden costs, as Prof. Tim Lang explained. Of the 19 leading risk factors of disease, which account for 58.8 million deaths each year, food is a contributory factor in 10 of these, for example cardiovascular disease (CVD). In 2011 to 2030 CVD will cause economic losses of $15 trillion. From 2010 to 2030 non-communicable diseases such as diabetes are estimated to cost 48% of global GDP and yet the cost to prevent many of these diseases is very small in comparison. Prof. Lang expands that if food systems are to be designed with public health in mind they would look very different: more horticulture, less meat and dairy production for example. Dr. Pete Myers, Environmental Health Services, talked about the impacts of agrochemicals on human health, of which only the tiniest fraction of chemicals have been studied and linked to health and economic costs. Much of our knowledge on the impact of agrochemicals is based on outdated methodologies, ignoring the huge advances in epigenetics and endocrine disruptors of more recent years as well as cocktail and timing effects. For example, many chemicals whose properties we thought we knew may have a different impact when combined with other chemicals and exposure to even low doses of chemicals can have a profound effect, sometimes much later in life. Dr. Myers gave as an example the effect of 2.5 parts per billion (ppb) of atrazine (farmers usually apply at higher concentrations) to frogs from hatching to adult, the result was the conversion of a genetic male to a fully functioning female (i.e. able to reproduce). In another experiment, the same strain of mice, eating the same amount of calories and undertaking the same physical activities, would become obese when exposed to 1ppb of obesogens (commonly used as fungicides) from birth, stem cells that would have become bone cells becoming fat cells.